Falklands War – Argentine Perspective – An Inevitable Defeat? Note the following text is the script, not an article. In the Falklands War in 1982 Argentina suffered a disastrous defeat, thus many believe that Argentina never stood a chance. Yet, taking a closer look at the Argentine side reveals that the conflict wasn’t a forgone conclusion at all. During and prior to the conflict the Argentine leadership committed many blunders. 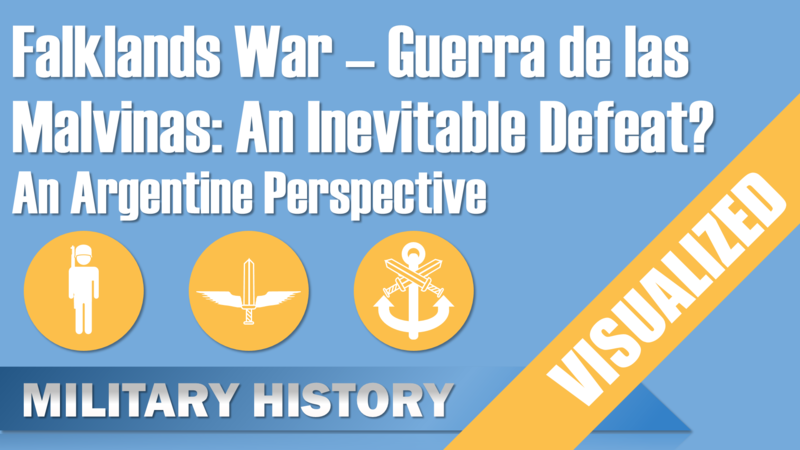 Note that at that time the Argentina was led by a military junta consisting of the commanders in chief of the army, navy and air force.So let’s take a look at the various factors that were crucial for the outcome of the war. The first major problem was the timing. The original Argentine invasion of the Falkland Island or Islas Malvinas as they are called Argentina was scheduled for the 15th of May or later, which would have made British operations more difficult due to the changing weather. After all the Falkland Islands are located in a rather cold area of the Atlantic. Yet, the occupation began on the 2nd of April, basically the Argentine Navy and Army performed the “landing at a time that now looks almost if it had been picked by Britain” Robert L. Scheina (Naval Historian; quoted after Pedraja, p. 239). It should also be noted that the Argentine Forces were due to receive new equipment, whereas the British Forces were experiencing major cutbacks. Furthermore, the invasion itself was performed with an unnecessary show of force. The Islands were defended by a British garrison of around 100 men, yet the Argentine Navy showed up with almost all of its warships including it’s aircraft carrier. Due to this major mobilization the British were notified a week prior to the actual occupation of the islands.This commitment to use the whole Argentine navy was a clear contrast the following lack of commitment that happened after the occupation. The next major problem was the rivalry within the Argentine Armed Forces. The whole invasion was planned by the Army and Navy alone, only in January 1982 they informed the Air Force, but since the Air Force wasn’t part of the operation, it couldn’t oppose the operation. Since there was no certain date and the Air Force wasn’t allowed to perform maritime operations anyway, it didn’t prepare until late March 1982. Also the rivalry didn’t change significantly even after the bullets started flying. The conflicted was started by the Navy and Army, yet both largely dropped out of the war rather soon leaving the heavy lifting to the Air Force, which was basically dragged into the conflict shortly after the occupation of the islands. Nevertheless, the commander of the Air Force and his men were eager to show of what they were capable off. So let’s take a look at the air force. The Argentine Air Force was the ugly duckling of the Armed Forces, although it was military the best trained, it was politically the weakest, especially in the junta during the Falkland War. Army bases were located near air force bases officially for protection, yet this was mostly to keep pressure on the air force. One aspect that severely inhibited the air force in the Falkland War was the fact that the in 1969 the Navy received the exclusive jurisdiction to defend Argentina from a sea attack, thus equipment, training and doctrine was completely oriented towards ground attack. Another major problem was the lack of navigation equipment, especially for maritime operations, but some planes lacked even a simple navigational radar. To deal with this situation better equipped planes were used as guide and also civilian Learjets. Furthermore, due to the navigational deficiencies” the radar on the Falkland Islands assumed an importance out of proportion of tis traditional role” (p. 247). It became probably the single most important equipment for the entire Argentine war effort. It provided navigational coordinates for the planes, warned them of nearby harriers and also detected many ships. A second radar would have been crucial as a backup and also due the “radar shadow” that was created by the mountains on the island, but none was deployed. This radar shadow allowed the British to remain undetected when they moved in for their landing troops. Although the overall state of the Argentine Navy and Army was probably not the best, their performance was definitely abysmal or even counter-productive. The main contributions of the the Navy came from one battalion of marines on the Falklands and their fleet air arm that operated from land bases, because after the loss of the cruiser Belgrano the commander-in-chief recalled all ships into the ports, thus the troops on the Falklands could only be supplied by the Air Force. The Army should have defended the Falkland Islands against a British invasion, but it mostly sent conscripts that were ill-equipped. Also the leadership of the garrison openly told them that the whole occupation was just a mock theater to reach a peaceful solution, thus while air force troops prepared air raid shelters they army didn’t fortify their positions properly. Nor did the army ship heavy artillery to the island. Probably one of the dumbest decisions was to reinforce the garrison on the freezing island with a brigade of conscripts from a subtropical region, while the best troops were kept in Argentina in case Chile would declare war. The fear of an attack from Chile and the fear of British submarines was constant, yet no action was taken to prepare the defense of the island in case of a British naval blockade. As mentioned before the Argentine Navy showed up with nearly all warships during the initial occupation. But these ships didn’t bring along heavy equipment to dig in nor a vast amount of supplies. This is probably one of the few examples in Naval History, when a cargo ship full of supplies would have better suited than an aircraft carrier. This lack of proper preparations was also – yet to a smaller degree – a problem with the air force. The general lack of the Army and Air Force to build fortifications and improve existing facilities was striking. On the mainland most of the improvement of existing air fields was done by local citizens, without them not much happened. Also the air force didn’t try to create new air strips closer to the islands. But most notable was the failure to improve the existing runway on the Falkland Island. Just adding access lanes or parking spaces could have improved the capacity of the air strip for cargo planes. (Limited to 6 planes simultaneously.) A certain amount of these shortcomings can of course be tracked back directly to the Argentine leadership. It completely misjudged the international relations. First they assumed that the United States would prevent a war between Argentina and the United Kingdom, after all both were Allies of the States. Furthermore, they assumed that they accumulated enough favors, yet this completely wrong assumption should have been abandoned when the United States tried to convince Argentina to accept the British demands. Another major misconception was the underestimation of the British to fight instead of seeking a diplomatic solution. This view was even prevalent at the lower ranks in the armies. The strong British determination was in complete contrast the Argentine unwillingness to commit after their initial steps. Basically, Argentine leadership kicked a British bulldog then turned around and thought everything would work out fine. Basically the only service that prepared itself at least properly was the air force and it also did very well. Yet, there were three major flaws that significantly lowered its overall effectiveness. The pilots focused their attacks mainly on warships, although the initial plan considered landing craft and troop ships as high priority targets. Although those ships were also attacked. Generally, air force pilots preferred war ships, but sinking those ships wouldn’t prevent the British troops from landing. These made the British merchant ships the weakest link in their plan. Something the air force failed to exploit. The air force used mainly small formations to attack British warships although evidence suggest that larger formations had a higher success rate. Probably the biggest problem was that a 60 % of all bombs dropped on ships failed to detonate. This was of course the result due to the focused on ground support, but the Naval Air Arm didn’t face this problem. Yet, due to the rivalry between the air force and navy, the navy didn’t provided any support on this matter nor did air force ask for assistance. Despite all of these shortcomings and the almost complete absence of the army and navy, the Argentine Air Forces still achieved several successes. Together the planes of the air force and navy destroyed 2 destroyers, 2 frigates and 3 support ships. The Falkland War could have a very different outcome if the Argentine forces would have fortified their positions properly and used their best troops instead of conscripts to defend the island. Furthermore, the construction and improvement of air fields on the island and on the mainland would have increased the air forces capabilities. The Navy originally planned an sortie after the British landing began, combined with an attack from the army against the invasion force this could have been enough pressure to defeat or at least stall the British invasion considerably. 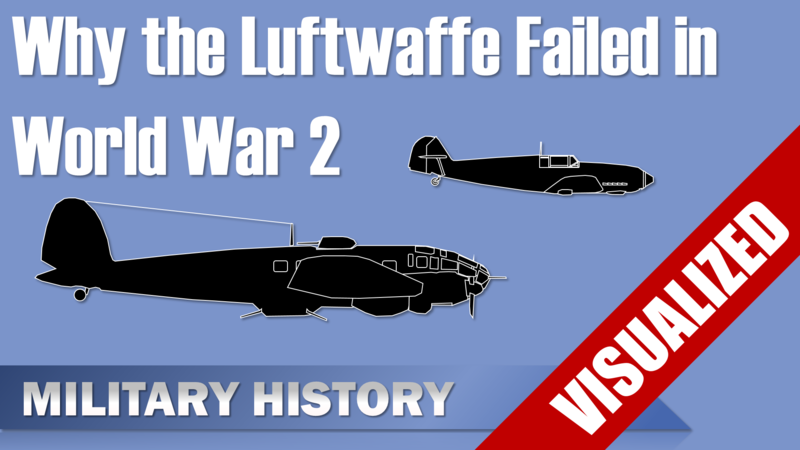 Only one of these aspects would have prolonged the conflict and due to the overstretched British supply lines, the changing weather and new aircrafts for the Argentine Air Force time wasn’t favoring the Royal Navy. Río Grande at Tierra del Fuego 690 (431 miles). Author MilHisVisPosted on April 14, 2016 May 22, 2016 Categories Air War, Cold WarTags air war, Argentina, cold war, Falklands War, Invasion, Islas Malvinas, Royal Navy1 Comment on Falklands War – Argentine Perspective – An Inevitable Defeat? The A7V or “Sturmpanzerwagen A7V” was the first German Tank and saw action in the later stages of the First World War. The rather unusual name of the tank was directly derived from a transport department in the war ministry, notably the department 7. (Abteilung 7 Verkehrswesen) (S. 54/2). The A7V was not only the first German tank, it was also the first fully-tracked built vehicle in Germany itself. In total only 23 were built, 2 of them prototypes, one with a wooden superstructure and one with armor plates. 1 radio variant (S. 76) and 2 production runs with 10 tanks each. Now these low numbers are important to consider if someone makes any assessment about it, because the tank gained a very bad reputation that doesn’t seem to be justified, but more on that later. Tanks in World War I were quite primitive and a completely new technology. A tank was basically a slowly moving pillbox with guns due to the limits in mobility, reliability, range, doctrine and command capabilities. Tanks were first and foremost an infantry support weapon and even after various technological improvements and years later this was still a common view until the successes of German Panzer Forces in early stages of World War II. The development of the A7V involved 13 companies and the production 20 due to the complexity of a tank compared to other weapon systems.(S. 14 / 2) The rather fast development of 11 months could only be achieved due to the fact that a large amount of components were already available in the various industries.(S. 15 / 1) The weapons were standard equipment, the armor plates were similar to those used on warships. Yet, the available engines weren’t sufficient in terms of horse power, thus a twin engine plant of production-ready engines was used. Although the tank was developed quite fast, the overall process of development and production was not straightforward at all. After the initial appearance of Allied tanks on the Battlefield in 1916 the German High Command was convinced of the tank as an important weapon. Yet, this view changed, after the following limited success of the Allied tanks. This restricted the development and production of German tanks and the allocation of resources. Especially since the highest priority was given to submarine warfare. Yet, after the success of British tanks at the Battle of Cambrai in 1917, the German High Command (in end of 1917 (November)) pushed again for the introduction of German tanks. Yet, instead of pouring all resources in the A7V project, many new projects were started that didn’t reach a sufficient production readiness before the end of the war. The change in requirements, resource shortages, changing priorities, shifting interests and the usual bureaucracy delayed ultimately the production of the A7V in significant numbers. (S. 60 & 61) Although it should be noted that even a larger number of these wouldn’t made a difference in the outcome of the war due to the lack of fuel and other crucial resources. In this case, I had a great and detailed source co-written by German historians and engineers, which you can clearly see, because the provided the values in millimeters, because everyone knows centimeters or even meters aren’t precise enough when you are German and dealing with the measurements of a 30 ton tank. The length was 7.35 m (7350 mm) with a width of 3.06 m (3060mm) and height of3.35m (3350 mm). The ground clearance was 0.2 m (200 mm) and a track width of 2.115 m (2115mm). 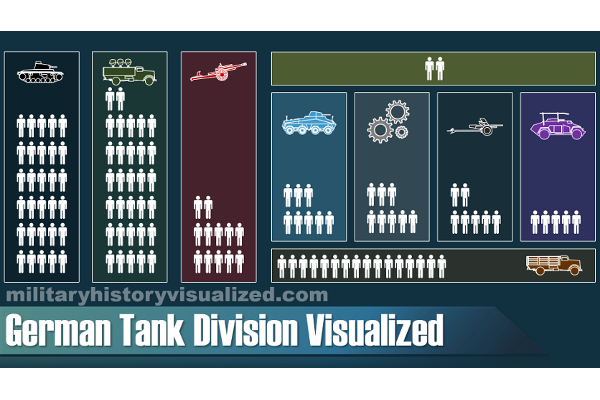 This is especially interesting or crazy, because the tanks were not of identical construction. It could traverse trenches up to 2 m in width, cross water at a depth of 0.8 m. Climb a vertical obstacle of up to 0.4 m and a climb a slope at 25 degree. The maximum achieved speed was 16 km / h.
With two fuel tanks each with 250 liters, it had a range of about 30 to 35 km cross country and 60 to 70 km on roads. The weight of the armor was 8.5 tons. The weapons with ammo made up 3.5 tons. And the crew with equipment another 2 tons, thus a total weight of 30 tons. You probably gonna wonder, why you need about 2 tons for the crew and their equipment. 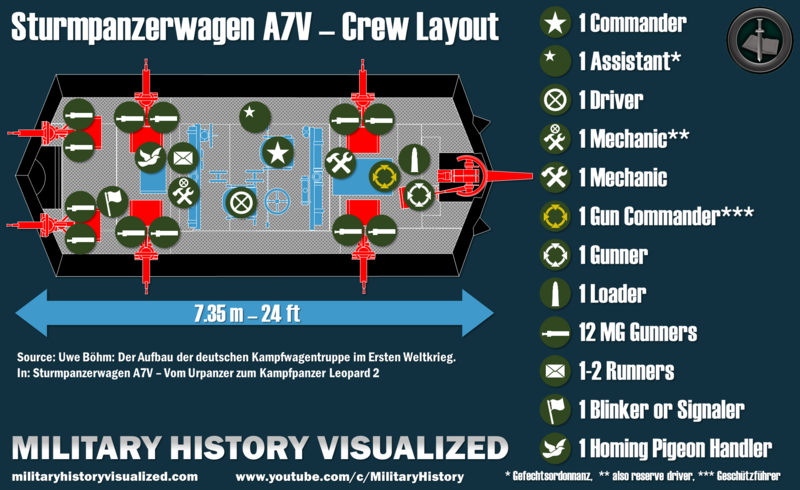 Well, that is because the A7V had a crew of just about 16 to 26 men. In comparison a British Mark V tank had about 8 men. In terms of protection it had a frontal armor of 30 mm, at the side and rear the armor plates had a thickness of 15mm. The top plates were 6mm thick. In comparison the British Mark V had a maximum frontal armor of 16 mm. The armament consisted of a 57mm Maxim-Nordenfelt gun which was mounted in the front and two 08/15 machine guns for each side and the rear. A large amount of amount of ammo was carried, initially 180 rounds for the 57mm gun, this value was later increased to around 300. The number of MG rounds was about 18 000. 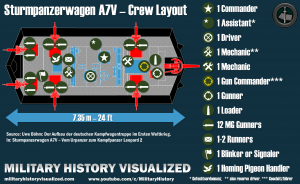 Take these values as broad guide lines, because there was a certain lack of standardization, which will be even more apparent when looking at the crew layout. Also note, that the seats are marked read here, because the ammo was stored in those seats. Imagine that beast in War Thunder with the Last Man Standing option, it would be almost unkillable if you don’t load any ammo. The A7V has a very bad reputation, the question is if this reputation is justified at all. Now, it had many problems and was quite unreliable, but to make a reasonable evaluation of it’s quality we need to take into account several factors. 1) The A7V was the first tank and also the first fully-tracked vehicle that Germany ever produced. 3) At the start of the development there were no captured enemy tanks available. 4) The production environment in Germany at the end of the war was everything but suitable to manufacture a complex and new design, due to a lack of qualified labor and resource shortages. 5) There was a total of 23 A7Vs including prototypes, in comparison both the French and British built more than 1000 tanks each. Calling the A7V a failure is as justified as calling the Tiger I a great tank in both instances only a few factors are considered. When it comes to the Tiger a lot of people completely ignore the reliability issues, yet it was designed and produced under better circumstances and far greater numbers than the A7V. The design flaws of the Tiger are hard to justify, because it was far from being the first German tank and many of the flaws weren’t addressed successfully in its considerable longer operational history than that of the A7V. Thus, my conclusion is that the A7V wasn’t a bad tank design as many people claim. Yet, it’s suitability for the realities of the Western Front and how it performed on the battlefield will be part of a future video, which will allow a more holistic assessment of its overall effectiveness as a military vehicle. I used the tank encylclopdia articles for references values on the Mark V tanks armour. Due to several errors in the Wikipedia articles of the A7V, encountered and corrected several errors on the A7V values.